Trains Today: Red pens at the ready! Red pens at the ready! is on the rear of the Anglian 'Short Set'. After a remarkable 16 years off the national network 37424 has made a remarkable return to traffic during 2016. On December 16th it hauled its first regular passenger train, since it's final passenger working for EWS, the Fort William portion of the Caledonian sleeper (diverted to Oban) on 7th March 2000. 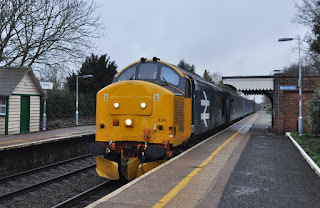 For those searching for 37/4's this locomotive definitely has a draw, not made any less strong by the out-shopping of the locomotive in BR Large Logo blue as 37558 in commemoration of the final year of operation of Avro Vulcan XH558. The locomotive has had extensive work carried out on it at Loram (formerly RVEL) at Derby including a complete re-skinning and major structural repair work to bring it from close to scrap condition back to a revenue-earning passenger locomotive. With the amount spent on the overhaul it is hoped that 37424 will continue to see use on passenger trains with DRS for some years. Is competition good for the South West Mainline?